Jill! Jill! Stein is Daft! Daft! Daft! So as if I haven’t written about the Green Party candidate more than she deserves, there has been a new development. One that has caused multiple people to contact me to say that one of the things I’ve reported previously about Dr. Stein is incorrect. Snopes.com, which normally is an excellent source of debunking misinformation, had announced that Jill Stein is not anti-vaxx. And lots of people are repeating their report. 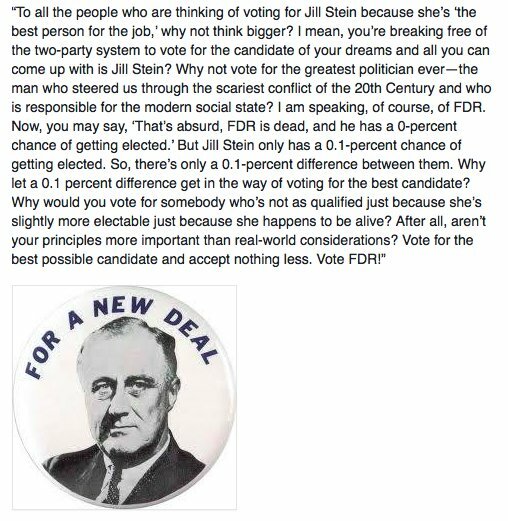 Now, in my previous blog post about why a vote for the Green Party candidate is a vote for Trump, what I said about Stein was that she flip-flops on this issue, depending on who she is talking to. Sometimes she’s anti-vaxx, sometimes she’s pro-homeopathy, and sometimes she is both pro-vaxx and anti-vaxx at the same time. In other words, she’s like the racist who says, “I’m not racist, but…” and then lists anecdotes purporting to prove that people of a certain ethnic background are more prone to committing crimes or something similar. All of that stuff about people not trusting the FDA and that there are real questions that haven’t been addressed? That’s all straight out of typical anti-vaxx talking points. She is literally saying that she isn’t anti-vaxx but…, and then quoting all of the anti-vaxx language. It’s a dog whistle. The anti-vaxx people recognize that what she’s communicating to them are that vaccines are dangerous, that they shouldn’t trust the people who say they aren’t, and so forth. So Snopes is wrong. Jill Stein promotes an anti-vaxx agenda, while pretending not to. I suspect that she probably isn’t sincerely anti-vaxx herself, but she’s promoting it for cynical political reasons. She’s being disingenuous when she says that there are real questions that haven’t yet been addressed. She flip-flops on it, because she knows that a significant fraction of the people idiotic enough to vote for her need to believe. But she also knows that some of the other people who are susceptible to her pitch aren’t anti-vaxx, so she tries to pander to both: Jill Stein Watered Down Her Own Statement Rejecting the Myth That Vaccines Cause Autism. Similarly with the homeopathic stuff. She has used the language of homeopathy intermixed with statements that sound reasonable to someone who isn’t really familiar with the usual talking points of the homeopath quacks. She frequently falls back on claims that science hasn’t been able to prove absolutely beyond a shadow of a hint of a doubt that something isn’t caused by whatever is currently under discussion. Never mind that you can’t prove a negative, and what the standard is in science is to gather evidence, try to falsify your theory, and after lots of people have tested it in various ways, conclude that the preponderance of the evidence says thus and so. And it’s not the only pseudo-science that she promotes: Jill Stein says it’s dangerous to expose kids to wifi signals. She has no chance of winning. The person who is quoted in the graphic I linked above guesses her chance is one-tenth of a percent, but that wrong. She is not on the ballot in enough states to add up to the number of electoral votes needed to win. Many of the states where she is not on the ballot do not allow write-in votes for President. Many of the states where she is not on the ballot will not count write-in votes for President if the candidate has not registered electors with the state. The Green Party doesn’t have electors in most of those states. It is literally impossible for her to win. That’s not an opinion, that’s fact. Her candidacy is worse than a joke, it’s a scam. Don’t fall for it. Cultural Note: My title today is a cultural reference to a one-woman play written by Pat Bond and Clifford Jarrett in the late 70s, Gertie, Gertie, Gertie Stein Is Back, Back, Back. Their title was itself a reference to the Time Square Reader Board’s report at the beginning of Gertrude Stein’s U.S. lecture tour in 1934. Please give yourself a prize if you recognized the reference.